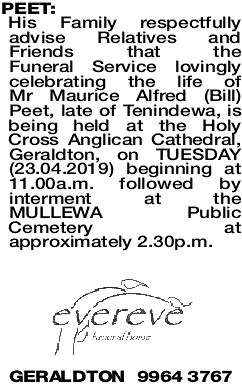 His Family respectfully advise Relatives and Friends that the Funeral Service lovingly celebrating the life of Mr Maurice Alfred (Bill) Peet, late of Tenindewa, is being held at the Holy Cross Anglican Cathedral, Geraldton, on TUESDAY (23.04.2019) beginning at 11.00a.m. followed by interment at the MULLEWA Public Cemetery at approximately 2.30p.m. 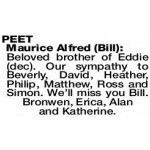 PEET BILL Our deepest sympathy to Beverly and the family. Many happy memories of our special times together in Mullewa. 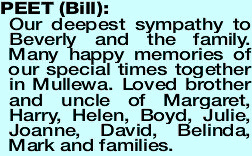 Loved brother and uncle of Margaret, Harry, Helen, Boyd, Julie, Joanne, David, Belinda, Mark and families. 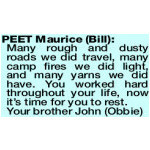 PEET Maurice BILL Many rough and dusty roads we did travel, many camp fires we did light, and many yarns we did have. You worked hard throughout your life, now it's time for you to rest. Beloved brother of Eddie (dec). Our sympathy to Beverly, David, Heather, Philip, Matthew, Ross and Simon. We'll miss you Bill. Bronwen, Erica, Alan and Katherine. 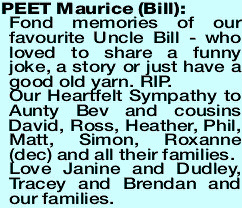 PEET Maurice BILL Fond memories of our favourite Uncle Bill - who loved to share a funny joke, a story or just have a good old yarn. RIP. Our Heartfelt Sympathy to Aunty Bev and cousins David, Ross, Heather, Phil, Matt, Simon, Roxanne (dec) and all their families. Love Janine and Dudley, Tracey and Brendan and our families. Deepest sympathy to Bev and families on the sad passing of Bill, our dear friend and neighbour.